Cow burps were supposed to be the problem. As a substantial source of methane, cattle (and other ruminants) naturally boosted the planet’s greenhouse gas emissions (GHG). From there, the story suggests Meatless Mondays. By eating less meat, we can save the planet. Now we need to change the story. Sometimes, when inaccurate facts are reported, it’s tough to reverse their impact. Scholars told them they were wrong. The FAO had only measured a part of the picture. Yes, the animal side was right. But the transportation half told just a part of the story because it ignored manufacturing. Only the exhausts were counted rather than the whole supply chain. Happily the facts were corrected. But sadly, few people heard the accurate version. 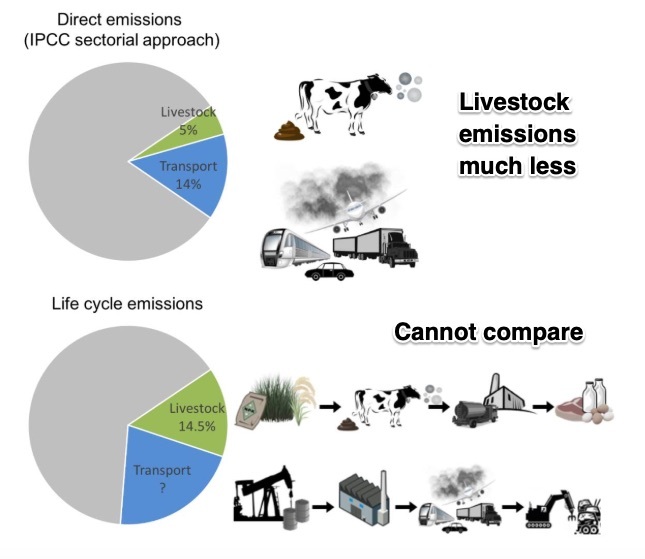 So yes, when we compare direct emissions created globally by human activity from transportation and livestock, the difference is 14% vs. 5%. And it might not even help for everyone to give up meat. Current research indicates the U.S. decrease in GHG would just be 2.6%. Meatless Monday for everyone? The difference is a .5% GHG drop. Greenhouse gas emissions are responsible for negative externalities. The people who create them harm the lives of many uninvolved third parties. However, electricity production and transportation each produced 28% of all U.S. GHG emissions in 2016. Much less, animal agriculture was the source of 3.9%. Furthermore, we could say that ruminant animals produce positive externalities. 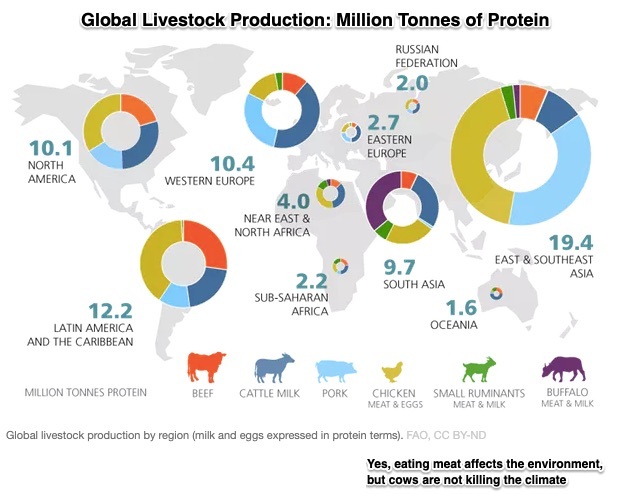 As an an important source of protein, meat is a growing part of the diets in developing countries. Where are we? Meat from ruminant livestock creates negative and positive externalities.Choosing between the two, we can assess our tradeoffs. As economists we know there is no free lunch, especially not one with meat. My sources and more: Thanks to Henrietta A. for alerting me to the mistaken view of cows and methane. From there, I suggest this closer look at cars or livestock.